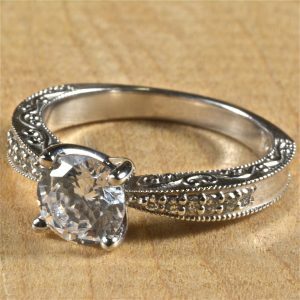 Shopping for a Conflict Free Engagement Ring - Leber Jeweler Inc.
It’s one of the biggest and most symbolic purchases of your life. You want an engagement ring that reflects the ethics and values you two share. But shopping for an ethical engagement ring can be a daunting task, with far too many marketers busy greenwashing the truth. Here’s a short guide to what you should know. Choosing a metal type often comes down to, does she prefer white, yellow, or pink? Like with the center stone and its origin, knowing where the metal came from is an important step. We offer recycled precious metal. Simple reason being, there are no gold mines meeting our environmental and social standards. What about a small scale gold mine? Maybe. But before you use their gold, make sure they don’t use cyanide, since most small scale and large scale mines use this very nefarious chemical to extract gold from rock. Today, most jewelry is made overseas, often in big sweatshops. Not a pretty beginning for something supposedly beautiful. There are even a few right here in the US, so don’t think “made in USA” necessarily solves the problem. Virtually every large jewelry corporation, including the self-described “ethical jewelry companies,” outsource their jewelry production to large third-party production facilities. (And some of these outsource to a fourth party, making the supply chain even more opaque.) At Leber Jeweler, we make our jewelry right here, in Chicago. Even if you don’t buy from us, buy from someone who actually designs and makes jewelry. There are still a handful of small craftspeople left in the world and they need your support. What about a colored stone? OK. Here’s a joke. What’s the most ethical diamond ring? Answer: A colored stone ring. Actually, we wish that were always true. While all of our responsibly sourced colored stone rings are fair trade and ethically mined, coming from small projects, many of which we’ve helped throughout the globe as part of our development work, a large percentage of colored gemstones sold on the market today, often have issues equal to, and sometimes worse than, conflict diamonds. This being said, we like colored gemstones better than diamonds because the ones we offer come from small mines where the economic return to the local community is greater than any diamond. And the most ethical engagement ring is… ? It’s the one your grandmother gifts to you. Or you mother. Or your aunt. Because “ethics” is a value, just like tradition and sentimentality. You can always reset her center stone into a new Earthwise Jewelry® design, and combine the old with the new. As for the second most ethical one? In our humble opinion, it’s a fair trade colored gemstone, or a Canadian conflict-free diamond, set in a recycled precious metal ring made by actual craftspeople who do what they do, not because it’s a clever marketing idea to make money, but because making jewelry is their craft. Who knows? The ring you choose today may someday be a gift to a next generation that you as a grandmother, or mother, or aunt, pass along. So you’ll be sharing not just the ring, but a small part of your values as well. In the meantime, enjoy the ring you choose! An engagement is a very special time and the ring only plays a small part in this momentous and joyous occasion.